Once upon a time, there used to be a division in how people saw the web. That division drew a line between online communication that intended to connect and online communication that intended to persuade and sell. And that distinction was, of course, completely bogus. As it happens, Brian Clark, Copyblogger’s founder, was an early heretic trying to show people that there was no difference between connection and persuasion. Connection and persuasion belong together — because they work better together, and because it’s a natural, normal way to communicate and do business. But as we all know, people don’t just land on your website, feel an instant sense of connection, then rush to your shopping cart and buy something. Although that would be very cool. As a content marketer, it’s your job to build relevant paths for people to walk through your site, get a sense of what you do, and — if it’s a good fit — go on to become happy, loyal customers. Good salespeople have always known that connection matters in commercial relationships. There’s the creepy kind of salesperson who tries to connect but just comes across as clumsy and predatory. And the great kind of salesperson who actually gives a damn about prospects and long-term relationships. Internet-savvy prospects don’t have to put up with aggravating sales pitches. Annoyed online users will block your ads. They’ll mark your irritating email as spam. Or they’ll just close the tab and never see you again. The web gives us wonderful tools to mute the volume on people who get on our nerves. And the first targets for those tools were the salespeople and ads that tried to take our attention for granted. How do you make that connection that keeps you out of the dreaded spam filter? It starts with being human and helpful. You might notice that we use the term “friendly authority” quite a bit around here. Instead: A friendly authority is an intelligent, reasonably sane human being who clearly communicates solutions to problems in your topic. You just have to be useful, interesting, and human. If you want to go a step beyond a simple connection of one human to another, you can start thinking about how you communicate your values and the values of your organization. It makes me sad that “values” have become a cheap buzzword. At best, that gains an eye roll. But those abstract nouns we call values or beliefs are also what give our lives meaning. They bring organizations and communities together. Good businesses live by values — whether or not those values are spelled out. But beyond that, as a writer and content creator, you have values that will help you get better at everything you’re doing today. If you want a quick exercise you can start right now, pick five values that matter to you. These are concepts like “Family,” “Integrity,” “Freedom,” that kind of thing. Write a couple of paragraphs about one. Do that with a different value every week. Maybe on Monday mornings. When you spend a small amount of time thinking about your values, those values will start to make themselves felt in your work. Your writing, your videos, your podcasts, your graphic design, will start to resonate with something beyond the nuts and bolts of your topic. When you’re connected with your values, you communicate with conviction. When you communicate with conviction, others feel it — and often they’ll want to connect further. Content marketing’s purpose is to make it a whole lot easier to sell stuff. Thoughtful, well-executed content paves the way for what we want our audience to do — whether that’s buying something, opting in, or some other activity. We use content to create a context of persuasion, so that when we move toward a business transaction, it makes sense and feels logical and natural. Does that mean content marketing doesn’t do any selling? Well, only if you absolutely don’t care what your audience does next. If you’re crafting content as a hobby or to gain attention for something fun, that’s fine. If you’re crafting content to support a business, it would be great if people bought stuff. Conversion is what happens when interest turns into action. Our friends the traditional copywriters are excellent at this step. They have a lot to teach about persuasive language, clear calls to action, reduction of risk, and all those other excellent copywriting topics. We try to make those topics user-friendly and accessible (even for those who are a bit nervous about selling) right here on Copyblogger. Conversion uses a different toolkit than connection and conviction do … but that doesn’t mean you’re going to throw your values and your relationships out the window. Remember that making sales online — particularly in a world of spam filters and ad blocking — is about constructing paths that lead people to your business. All of the stones in each path should fit together. 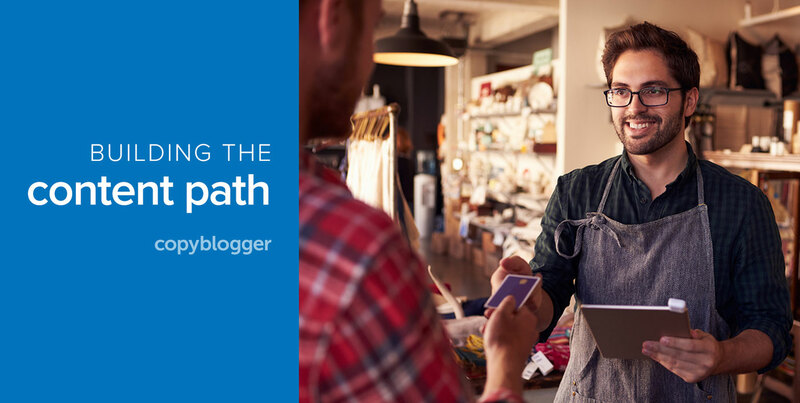 The more strategic content you create, the more paths you build — and the more business you’ll attract and convert. If you’re terrific at creating content for the relationship part of the path, but your conversion steps are clumsy or awkward, your users will stumble … and they won’t move forward. Some marketing education focuses just on conversion techniques — crafting great ads, landing pages, and sales sequences. Some marketing education focuses just on connection and conviction techniques — earning and nurturing relationships, without any of that pesky selling. If you want to create content that markets a business — whether it’s your own business, a client’s business, or an organization you work for — you need to hone your skills for the whole path. That’s what we designed the Authority community of content professionals to do for you. If you’re curious about joining our community, here’s where you can get the details and get started. As one who was there in the beginning, the distinction was not as suggested here between connection and persuasion. Rather, it was between connection and commercialization. The coin of the day was “Information wants to be free.” It was like the old west before settlers came, before the gold rush…. the land was open and there were no title deeds or lawyers. But like the Old West, eventually there was a land grab, and rules set up and ownership and commerce. This was inevitable. This is not a matter of good vs evil… just a reality of the cyber realm. There are still the purists who are less concerned about financial, but the rest of our physical world is now transplanted to the web, which is a reflection of the people in real space time reality who have chosen to populate it… with social interactions and commercial interactions and all other kinds of interactions. Inasmuch as this is a commercial endeavor, it can be noted that commercial endeavors online or off involve making connections… In that regard there is no division. Funnily enough, immediately after Stewart Brand said “information wants to be free,” he said “information wants to be expensive.” The two sides of the coin have always been there. Sonia you have delivered a wonderful piece of content here. When people ask you about yourself, tell them straight up. Answer their questions, and then ask about them again. Do not run on about yourself. Whatever they ask, answer. Period. Really eye opener and educational. Thanks a lot Sonia for interesting writeup.